In the spring of 1878, the California State Commissioners of the Yosemite Grant received an application “from the Rev. J.K. McLean and others, representing an association known as the Sunday School Union, for permission to erect in the Yosemite Valley a chapel, which should be used for undenominational purposes.” The application was granted, and a “handsome, tasteful building” was erected the following year near where the present Four Mile trailhead is located today. 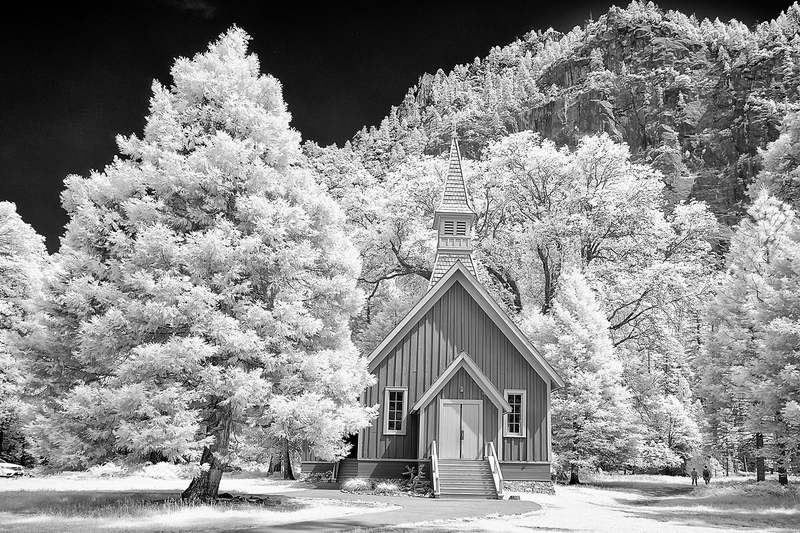 The chapel, which is the oldest structure in Yosemite Valley, was designed by Charles Geddes, an accomplished church architect from San Francisco. Geddes’ son-in-law, Samuel Thomson—with whom he collaborated on other church projects—is believed to have been the project’s contractor. Designed in a “New England style” to seat 250 people, the chapel originally consisted of only one room, 26-by-50 feet long, with inside stud walls and rafters left exposed. Eventually an addition was added to the back of the church. By 1901, the surrounding “Lower Village” had nearly disappeared, so the chapel was relocated to its present location in the Old Village. In 1965 some interior restoration was completed, and the foundation was raised 3 feet to help protect the structure from periodic flooding. In spite of these efforts, the chapel sustained damage during the 1997 flood and required further restoration.